Rosehip oil is rich in antioxidants, Omega 6 and Omega 3 fatty acids, and vitamins that help prevent acne and clear scars. Moreover, this beauty oil is used for the face, skin, hair and nails. If you are wondering which oil to buy, here is our list of the best organic rosehip oils. You can also learn more about rosehip oil for acne scars in our guide. Why I like it: This is my top pick when it comes to the best organic rosehip oils for acne. It’s not hard to know why it’s also very popular on Amazon. Radha Beauty is known for creating top-quality facial oils and their organic rosehip oil is no exception. It is 100% cold-pressed and certified organic. By using this oil, you can get the numerous benefits of rosehip for acne and acne scars. Just put 3 to 5 drops on your face – the bottle will last for a couple of months. It is also reasonably priced. 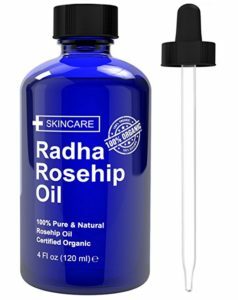 Check it out now and know why many considered the Radha Beauty Organic Rosehip Oil as their holy grail in beating acne and scars. Some even considered it more effective in removing scarring and blemishes than their chemical peels. 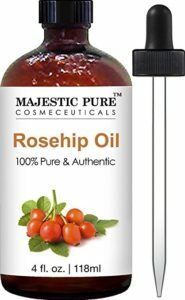 Why I like it: The best organic rosehip oils come from Chile and one of these is the Majestic Pure Rosehip Oil. Majestic Pure is a company based in California. They provide pure, safe and effective botanical oils backed by science. The company uses a solvent-free extraction process to retain the nutrients of the oil. Apart from that, they also keep the oil 100% pure, organic and cold-pressed, so you can be sure that there are no additives and fillers. 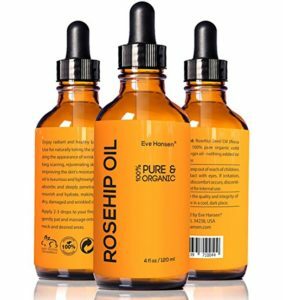 This organic rosehip oil is gentle enough for people with dry and extra sensitive skin. It has a clean smell and can be mixed with other oils for many skin care recipes. The consistency of the oil also makes it great for moisturizing hands and nails. They even offer a refund if you are not satisfied. Why I like it: This is one of my recommended brands of rosehip for acne. You should check out that guide if you want to learn the best ways to use rosehip to fight acne. This was a great option because it is light and fast-absorbing. Try this if you have oily skin. It helps reduce the appearance of wrinkles, eye bags, dark spots and acne scars. It may be more expensive than Radha Beauty Organic Oil but it comes in a convenient pump bottle. You can use it also to moisturize hair and reduce or prevent stretch marks. 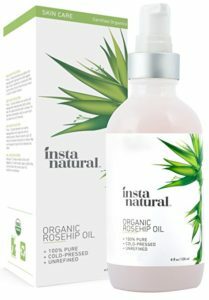 Why I like it: This is the most affordable in my list of best organic rosehip oils but it does not disappoint. People apply this on their face and some discovered that it helped their eczema and psoriasis. In addition, it is an intensive moisturizer for cuticles, scalp, stretch marks, and hair. Molivera Organics give a 100% money back guarantee on this product so you have nothing to lose. Why I like it: Eve Hansen is a company known for crafting only the best products, and this is one of them. 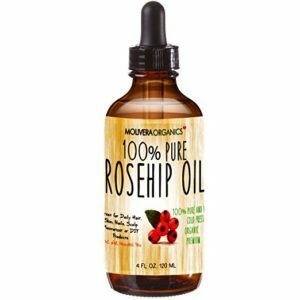 This organic rosehip seed oil is top when it comes to quality because it is certified by the USDA. It is also bottled in the USA in an FDA registered facility to ensure proper handling. Aside from their quality products, Eve Hansen is also popular for their customer service and quick response to concerns. You can check out reviews on Amazon to see a list of their satisfied customers and then try this miracle product for yourself. These amazing products are all available on Amazon. If you want to learn more about how to use them, you can also check out my complete guide on how to use rosehip oil for acne and acne scars.